When Karma the cow was rescued from terrible conditions at a small farm a few years ago, she should have been happy. But she wasn't. For the first day and night she wouldn't stop crying, baffling rescuers as she filled the air with mournful pleas. It wasn't until the next day that rescuers at California's Gentle Barn Sanctuary noticed something: Karma's udders were full of milk. They quickly realized that she must have had a baby who was left behind at the farm, so they rushed to call her former owners. . Karma did have a little baby — who was on his way to the butcher. 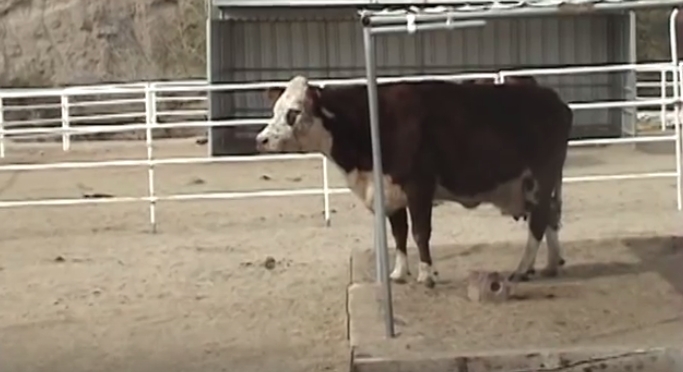 In a stroke of luck, the car he was being transported in broke down, and rescuers were able to claim the little calf. .
What followed was a stunning reunion that shows just how strong a cow's maternal love can be.The moment Karma sees the trailer approaching, she instinctively jumps to her feet and begins to call out. As soon as she sees him, she rushes over to the fence, desperately trying to reach him through the barrier. . Responses to "Crying Mother Cow Greets Lost Baby In Breathtaking Reunion"
The people that sold momma and made no mention of the calf (and were sending it to the slaughter house) are totally heartless. MAY GOD BLESS THEM ALWAYS..AMEN.. It's such a sad situation....most cows in the dairy industry endure this....the cries are terrible that's why they seperate the two as soon as possible, hoping mothercow won't attach too much. Wonderful, Not much longer and the Baby wouldn't have made it. So heart-warming and touching. Cows are also God's creation and have as much right to live as anyone of us. There is too much cruelty and sufferings in the World!! Baruch Hashem Elohim !There is no excuse for the horrific treatment of his creatures ! May it be Hashems will to reward all your efforts ! Seeing this mother united with her child was so heartwarming ! If it does not make tears of joy flow you are dead inside ! Love the video, but you really don't need the song. I think people get it.